I was working on the truck the other day because it was having clutch issues. While waiting for some parts to get in I decided to take a look inside the transmission. Why? I wanted to see what condition things were in and I also wanted to see what was in there. Sure there are pics on the internet but it’s not the same. Manual transmissions work on the simple mechanics of gears ratios unlike automatic transmission that work on the principles of dark energy from a witch doctor. This a Borg-Warner T5 5 speed, plus reverse, transmission that was used to light duty applications in passenger cars and trucks starting in the early 80s until the late 2000s. Early models were rated at 265 ft-lb of torque with the later ones being around 330 ft-lbs. They’ve been used in Camaro, Firebirds, Mustangs, S-10s, 300ZXs, as well as a few other applications. The latest use I’ve been able to find is behind the V6 in 2010 Mustangs. It comes in different configurations and was used in rear and front wheel applications. Not a bad track record for the little transmission. Here’s a picture of the transmission. It was standing up at the time so I’ve rotated it for you. The input side is on the left and the output is on the right. There are two lines that approximate the location of the mainshaft (red) and countershaft (green). The mainshaft is made up of the input and output shafts. The countershaft is used to transmit power between the two parts of the mainshaft. The hole in the top of the transmission is where the shifter mounts. 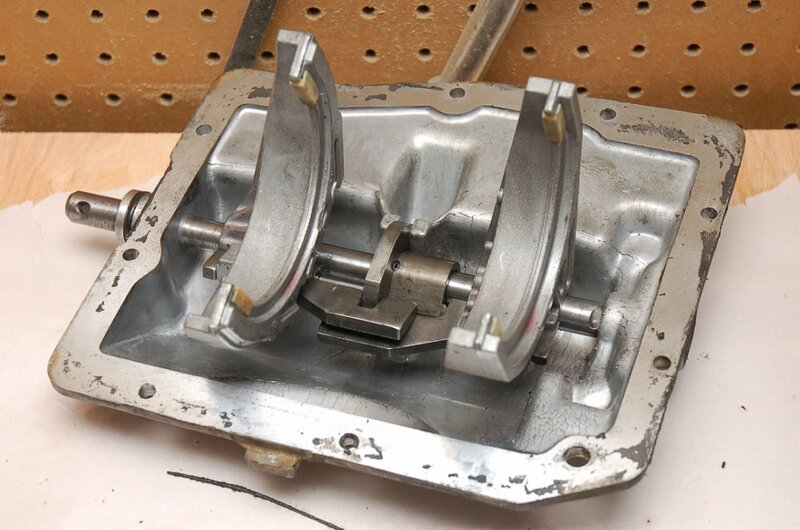 There are two main sections of the transmission housing. The main case is on the left and the tail housing is on the right. The line of bolts near the middle of the picture holds the two parts together. When you shift gears, you’re actually moving a shaft in and out and rotating it as well which moves the shift forks. The shaft and the mechanism in the middle controls how the shift forks are moved. Only one shift fork moves at a time and sometimes neither moves in the case of reverse and 5th gear on this transmission. In the picture below you can see the shaft and the shift forks. Here is a picture looking down into the main case. In this picture and all the others below, the input side is on the right and the output is on the left. 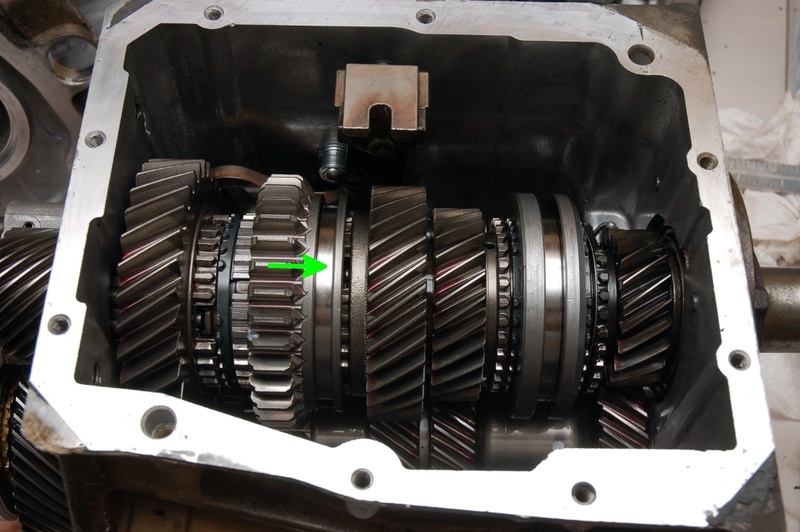 The T5 was developed from the T4 transmission which is why there is no 5th gear in the is picture. 5th gear is outside of the main case and you can barely see it in the lower left hand corner of the picture. The shaft on top is the mainshaft and shaft partially hidden below is the countershsft. 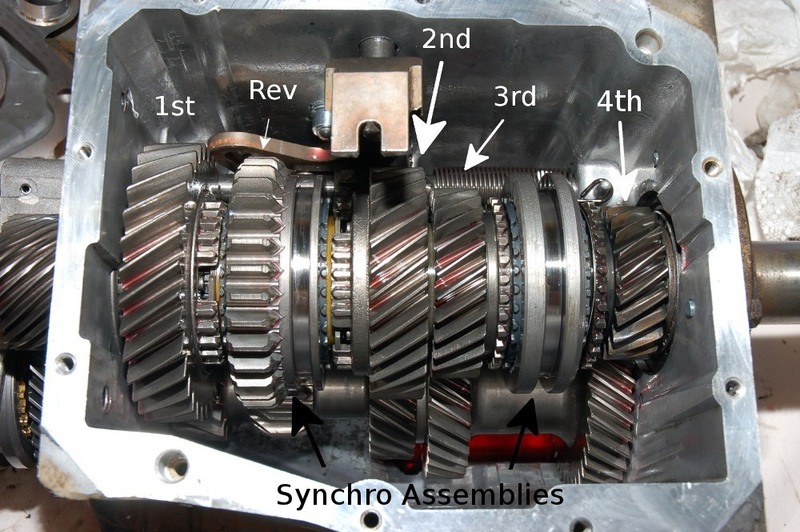 The parts labeled “Synchro Assemblies” are connected to the input shaft while everything else is connected to the output shaft. 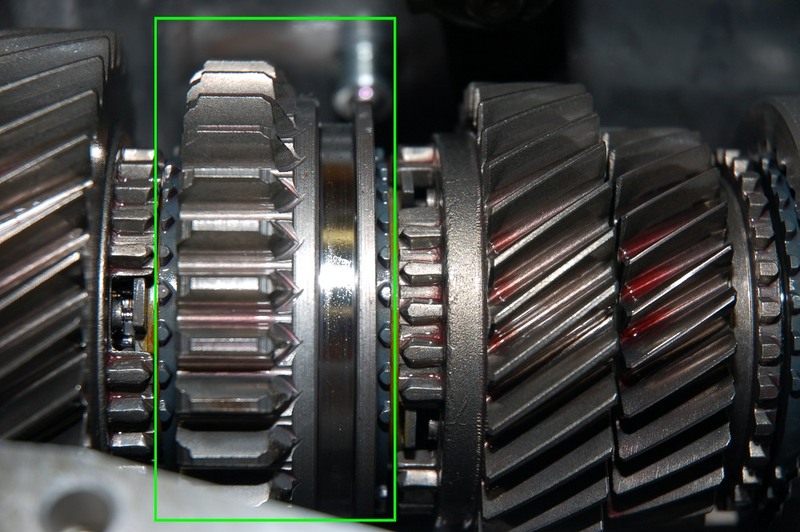 The transmission works by the silver rings in the sychro assemblies, called a synchronizer sleeve, getting moved forward or backward by a shift fork to interlock with one of the gears. The lever arm near the top of the picture controls 5th gear and reverse. The red fluid you see on the gears and in the bottom of the main case is Automatic Transmission Fluid which is the lubricant the T5 uses. 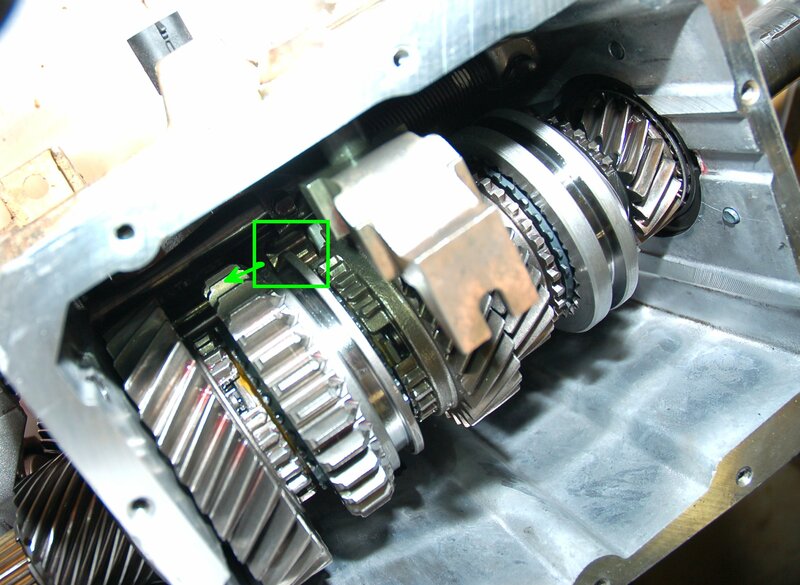 To shift into first, the shift fork moves the 1-2 synchronizer sleeve towards the aft of the transmission connecting the synchronizer hub (gear under synchronizer sleeve) to the first gear. Similarly, to shift into 2nd gear the shift for moves the synchronizer sleeve forward. To shift into 3rd or 4th, the 3-4 synchronizer sleeve is moved forward or backward while the 1-2 synchronizer sleeve is centered. On this transmission 5th gear is on the outside of the main case in the tail housing. It works just like the other forward gears with its own fork and synchronizer assembly. To go into 5th gear the 1-2 and 3-4 synchronizer sleeves are centered and the 5-R lever arms is pushed towards the rear of the transmission. This lever moves the 5th gear shift fork forward. To put the transmission in reverse the 5-R lever is pushed forward. 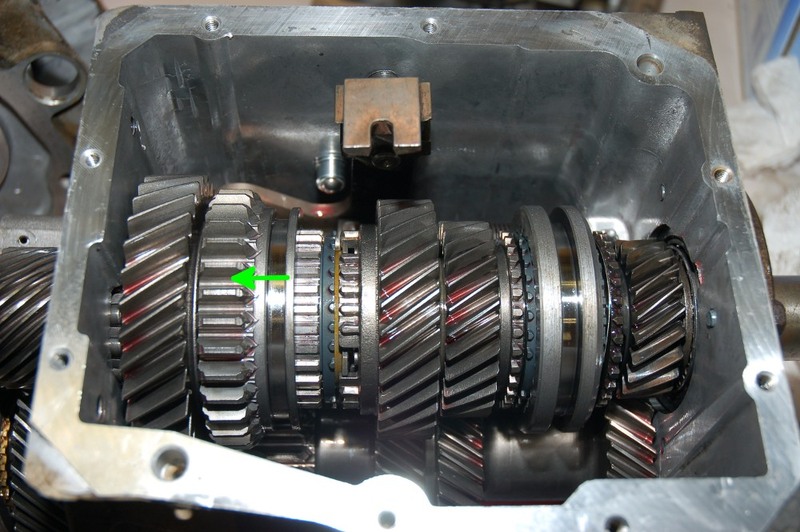 The 5-R lever pushes a small gear, called theReverse Idler Gear (green box) toward the rear to connect the gear on the 1-2 synchronizer sleeve to the reverse gear on the countershaft. 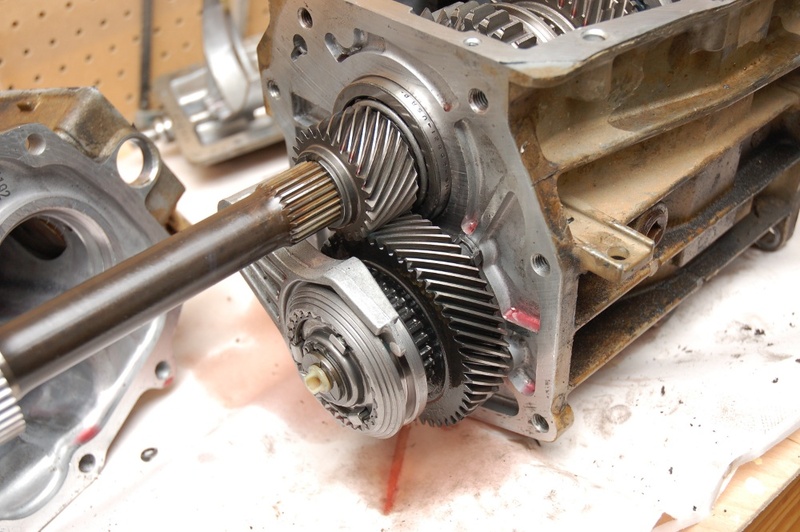 By using this extra gear the direction of the output shaft is reversed. Note that reverse does not have a synchronizer assembly to it. So what is a synchronizer? 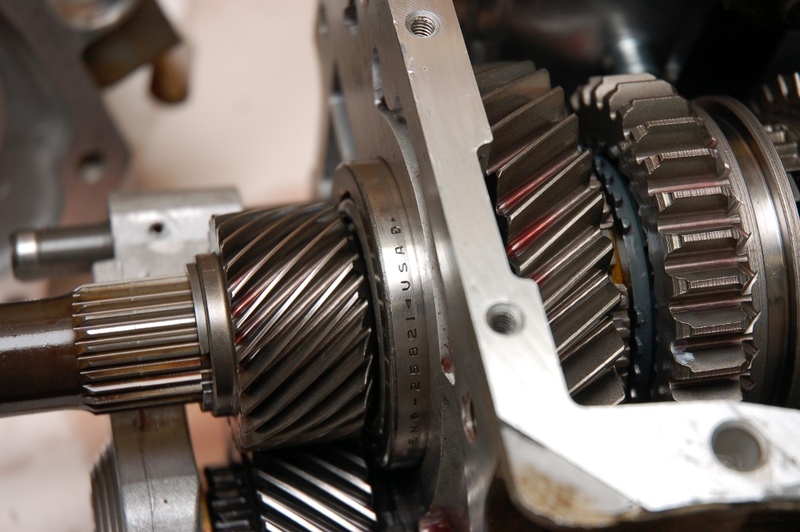 The synchronizer matches the speeds of the input shaft and gears on the mainahaft so that the gears mesh without grinding against each other. 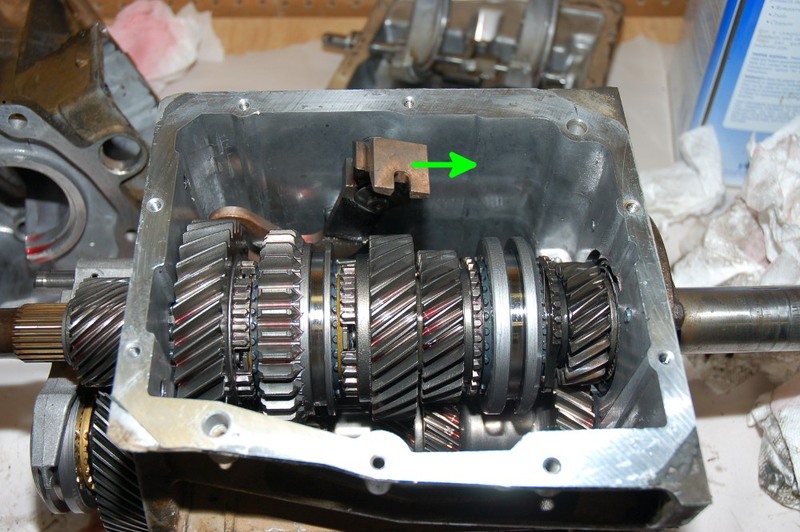 The item in the green box below is the 1-2 synchronizer assembly and as I mentioned before is connected to the input shaft. As the shift fork moves the sleeve, the gray ring, called a blocking ring, is pressed against the gear. This causes the input synchronizer assembly to rotate at the same speed as the gear. With the parts rotating at the same speed the synchronizer sleeve can move into its final position. As you’ve noticed this takes place very quickly when driving so that you never have to match RPM when driving or double clutch. If you want to see how nice synchronizers are try shifting without the clutch. For a much more in depth explanation of synchronizers go here. Why doesn’t reverse have a sychronizer? It’s a safety feature to keep you from shifting into reverse while moving forward. Other manual transmissions, such as the T56, have a synchronized reverse gear but have a reverse lockout to keep you from shifting into reverse while going forward. Hey what do ya know? Something made in the USA! Actually I imagine most if not all of the transmission was made in the US. So, that’s what is inside of a T5 manual transmission. In case you’re curious, most all the gears are helical because they run more smoothly and quieter than straight cut gears. Next, I need to find a broke transmission from a junkyard or online to repair for the fun of it. Hope I never have to visit the witch doctor to have my dark energy replaced! What a great post. I am fixing a T5 manual that has a broken shift fork and needed an easy to follow diagram of the numbered gears and workings. This was perfect. I am bookmarking this now. Any advice on what I should check while my transmission is out and apart? By any chance would you sell that trtansmission? It is the type I need to keep the shifter forward.